If you want to become more confident and skilled at creating better color schemes in your home, you'll want to master the language of color. The key to combining colors with great success is to learn the three characteristics of color-value, temperature, and intensity. I don't want you to be intimidated by the word hue, it's just another name for color. The other skill we'll talk about is combining colors. So first, let's learn about "value", which is merely the lightness or darkness of a color. Keep in mind that light values expand a space, while dark values contract it. You would do better to use Robin's Egg Blue in a small room as opposed to Navy Blue, for example. There are an infinite number of values in the world of color today, from the lightest lights to the darkest darks. So you are not limited in any way when it comes to color choices. The second characteristic is "temperature" and can be easily understand by just about everyone. It invokes a feeling of warmth or coolness. You'll find, if you were to draw an imaginary line across a color wheel, the colors ranging from yellow-green to red-violet invoke a feeling of warmth. They are referred to as "advancing" colors because they appear to be closer. They actually draw you into a room. While the opposite colors are considered to be "receding" colors. They appear more distant and create a calm, cool and spacious feel. The third characteristic of color is intensity, which describes the brightness of a color. There are 12 colors on the basic color wheel and they are all fully intense, or what is referred to as "saturated". You'll find that lower-intensity colors are more muted. You can become more comfortable with this particular color distinction by picturing two different versions of your favorite color. If we use a yellow-green for example, Lime would be much more intense than something like Willow. Use the same intensity of colors to unify your space. By choosing colors that have the same intensity, your room will seem more put together than a room with mixed intensity colors. You may have trouble, as some people do, with deciding the intensity or value of a color. If this is so, simply ask yourself first, if the color you are looking at is light, medium, or dark. That would be the value. Then proceed to distinguish if it is bright or dull. That would be the intensity. Next, we will explain color combinations. The word "monochromatic" refers to using one color in your room design. Keep in mind that monotony can set in quickly in one-color space, but if done well, and we found if it is mixed with a lot of white or off-white colors such as linen or cream, it can be done quite successfully. An "analogous" color scheme is achieved by taking colors that are side by side on the color ring, such as yellow, yellow-orange and orange. Using one common color is the key to creating an analogous scheme and adding an array of textures, patterns and finishes will help bring more variety to the look. "Complimentary" colors schemes will be those that are created by using opposite colors on the wheel, such as blue and orange, or yellow and violet. If you choose to use full-strength colors be sure to repeat them liberally throughout the space. It certainly doesn't hurt to wonder a little into colors that are near compliments to ease up on the sometimes, overpowering look. Our final color combo is "complex" color schemes. This is created by choosing colors that are evenly spaced around the wheel. You can use a three-color, or " triad" combo, such as yellow, blue, and red. You can also create a four color scheme which is referred to as a tetrad. 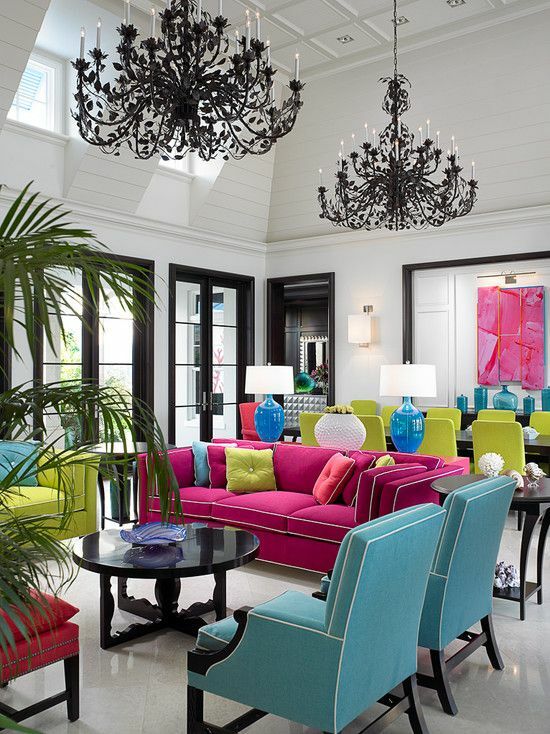 Whatever the look you're going for, we hope you have gained a little insight on the use of color. Choosing the right color scheme for your rooms is crucial to the way you will feel in your new space and it should be discussed and decided on by the whole family. The truth is, different personality types should also be considered when choosing a color scheme since colors have a way of making us feel calm or excited, so start with a sample and work your way up from there. Good luck in your endeavors. This is an example of a triad color scheme, same intensity.